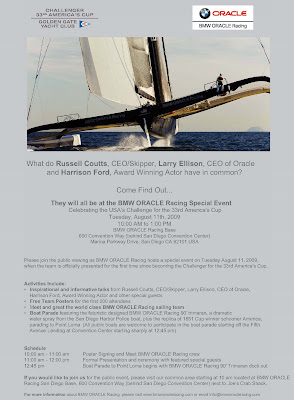 What does Russell Coutts, CEO/Skipper, Larry Ellison, CEO of Oracle and Harrison Ford, Award Winning Actor have in common? August 11, 2009, when the team is officially presented for the frist time since becoming the challenger for the 33rd America's Cup. If you would like to join us for the public event, please visit out common area starting at 10am.